Hypoxic tumors are refractory to radiation and chemotherapy. High expression of biomarkers related to hypoxia in head and neck cancer is associated with a poorer prognosis. The present study aimed to evaluate the clinicopathological significance of erythropoietin receptor (EPOR) expression in oral squamous cell carcinoma (OSCC). The study included 256 patients who underwent primary surgical resection between October 1996 and August 2005 for treatment of OSCC without previous radiotherapy and/or chemotherapy. Clinicopathological information including gender, age, T classification, N classification, and TNM stage was obtained from clinical records and pathology reports. The mRNA and protein expression levels of EPOR in OSCC specimens were evaluated by Q-RT-PCR, Western blotting and immunohistochemistry assays. We found that EPOR were overexpressed in OSCC tissues. The study included 17 women and 239 men with an average age of 50.9 years (range, 26–87 years). The mean follow-up period was 67 months (range, 2–171 months). High EPOR expression was significantly correlated with advanced T classification (p < 0.001), advanced TNM stage (p < 0.001), and positive N classification (p = 0.001). Furthermore, the univariate analysis revealed that patients with high tumor EPOR expression had a lower 5-year overall survival rate (p = 0.0011) and 5-year disease-specific survival rate (p = 0.0017) than patients who had low tumor levels of EPOR. However, the multivariate analysis using Cox’s regression model revealed that only the T and N classifications were independent prognostic factors for the 5-year overall survival and 5-year disease-specific survival rates. High EPOR expression in OSCC is associated with an aggressive tumor behavior and poorer prognosis in the univariate analysis among patients with OSCC. Thus, EPOR expression may serve as a treatment target for OSCC in the future. Oral squamous cell carcinoma (OSCC), the sixth most common cancer worldwide, is the most frequently observed head and neck cancer in Southeast Asia , but despite improvements in treatment strategy, clinical outcomes are not satisfactory. The cancer recurs in a large proportion of patients, and the outcome of salvage therapies depends on the clinical stage of the disease when it recurs . In Taiwan, many people in the lower socioeconomic bracket chew betel nut, which causes a significant threat to public health. In 2009, the rate of oral cancer was approximately 14.6 per 100,000 persons in Taiwan, and it is the fourth most common cancer in men (http://www.doh.gov.tw/statistic). In 2007, 22,560 new cases of oral cancer were reported in the United States, with approximately 5,370 deaths attributed to this disease . In humans, erythropoietin receptors (EPORs) can be detected on the surface of erythroid progenitor cells in bone marrow [4, 5] and in some non-hematopoietic cells such as vascular endothelial cells , retinal photoreceptors , liver stromal cells , neurons , and macrophages . Also, recent studies have revealed that EPORs play an important role in biological activities such as physiological angiogenesis in wound healing and the female reproductive system, and provides protection against anoxic damage in the brain  and cardiovascular system [12, 13]. Previous studies have reported that anemia is a poor prognostic factor for survival in patients with cancer  and that erythropoietin (EPO) treatment can improve the survival rate and quality of life of patients with anemia receiving chemoradiotherapy . However, more recent studies have shown that EPO treatment may have different results in breast cancer and head and neck cancer . Lai et al. found that the level of EPO and EPOR can affect growth and metastasis of head and neck cancer. A biomarker that could predict the prognosis of oral cavity cancer would be a valuable addition to traditional imaging. The aim of the present study was to evaluate the clinicopathological significance of EPOR expression in patients with OSCC. The study included 256 patients who underwent primary surgical resection between October 1996 and August 2005 for treatment of OSCC without previous radiotherapy and/or chemotherapy. Clinicopathological information including gender, age, tumor (T) classification, node (N) classification, and tumor, node, metastases (TNM) stage was obtained from clinical records and pathology reports. The TNM status was classified according to the 2002 American Joint Committee on Cancer Staging System. The treatment of oral cancer will be evitable to encounter the problems of local, regional or even distant failure. According to the guideline of our institute, the surgical salvage is the first choice if the tumor is operable. Otherwise, the patients will undergo salvage chemotherapy or chemoradiation if the tumor becomes unresectable although the prognosis of this group is dismal. To measure the expression of the EPOR in OSCC tissue and adjacent non-tumor tissues, fresh tissues were obtained from patients with OSCC biopsy specimens. These materials were histologically confirmed by frozen sections before quantitative RT-PCR, western blotting and IHC assays. The present study was approved by the Medical Ethics and the Human Clinical Trial Committee at Chang Gung Memorial Hospital, Taiwan. Tissue samples were frozen in liquid nitrogen and stored at −80 °C prior to RNA extraction. The tissue was homogenized using a Mixer Mill Homogenizer (Qiagen, Crawley, West Sussex, UK). Total RNA was prepared from the frozen tissue samples using an RNeasy Mini Kit (Qiagen) according to the manufacturer’s instructions. The RNA (2 μg) was then reverse-transcribed into cDNA using SuperScript II Reverse Transcriptase (Invitrogen, Carlsbad, CA, USA). For Q-RT-PCR, EPOR Taq-Man probes (ABI) were used. Data were represented as mean ± s.d. To analyze the distribution of adjacent-non-tumor and tumor areas, we used the Wilcoxon signed rank test between two groups for statistical analysis. A P-value of less than 0.05 was considered statistically significant. GAPDH was used as an internal control for comparison and normalization of the data. Assays were performed in triplicate using an Applied Biosystems Model 7500-Fast instrument. Tissue protein extraction was carried out in frozen samples that were homogenized in radioimmunoprecipitation assay (RIPA) lysis buffer [50 mm Tris–HCl (pH 7.5), 150 mm NaCl, 1% NP-40, 0.5% Na-deoxycholate, and 0.1% sodium dodecyl sulfate (SDS)]. The protein concentration in each sample was estimated using a Bio-Rad Protein Assay (Bio-Rad, Hercules, CA, USA). Immunoblotting was performed according to standard procedures. The antibodies included polyclonal antibodies against EPOR and β-actin (monoclonal; Santa Cruz Biotechnology, Santa Cruz, CA, USA). The first antibodies were detected by incubation with secondary antibodies conjugated to HRP (Bio/Can Scientific, Mississauga, ON, Canada) and developed using Western Lighting chemiluminescence reagent (PerkinElmer Life Sciences Inc., Boston, MA, USA). X-ray films were used to detect the proteins. Adjacent noncancerous and OSCC tissue samples were selected by a pathologist based on diagnosis and microscopic morphology. The tissues were fixed in 10% buffered formalin, then embedded in paraffin and decalcified in 10% EDTA solution. Representative blocks of the formalin-fixed, paraffin-embedded tissues were cut into 4-mm sections and deparaffinized with xylene and rehydrated in a series of ethanol washes (100, 90, 80, and 70%). Slides were washed with phosphate-buffered saline (PBS) and treated with 3% H2O2 for 30 min to block endogenous peroxidase activity. Next, the sections were microwaved in 10 mM citrate buffer (pH 6.0) to unmask the epitopes. After antigen retrieval, the sections were incubated with diluted anti-EPOR antibody (sc-101444; monoclonal; 1:200; Santa Cruz Biotechnology) for 1 h followed by washing with PBS. Horseradish peroxidase/Fab polymer conjugate (PicTure-Plus kit; Zymed, South San Francisco, CA, USA) was then applied to the sections for 30 min followed by washing with PBS. Finally, the sections were incubated in diaminobenzidine for 5 min to develop the signals. A negative control that omitted the primary antibody was run simultaneously. Positive immunostaining was defined as cytoplasmic and/or membrane immunoreactivity. The level of reactivity in the immunostained tissues was evaluated independently by two pathologists who were blinded to the subjects’ clinical information, and scored into four groups according to the percentage and intensity of cytoplasmic and membrane staining. Specimens in which >30% of the cells were stained were scored as strongly positive (+++), specimens in which 10–30% of the cells were stained were scored as moderately positive (++), and those in which <10% of the cells were stained were scored as weakly positive (+). Specimens with no staining were scored as negative (−) . A high level of EPOR expression was defined as staining of >10% of the tumor cells, and a low level of EPOR expression was defined as staining in <10% of the tumor cells. Several clinicopathological factors were evaluated, including gender, age (59 versus 60 years), T classification (T1, T2 versus T3, T4), N classification (negative versus positive), and TNM stage (stage I, II versus stage III, IV). Fisher’s exact test was used to evaluate the correlation between the clinicopathological variables and EPOR expression. A p-value less than 0.05 was deemed to be statistically significant. The clinicopathological variables and the expression of EPOR were taken into account for the analysis of survival based on the Kaplan-Meier method; statistical significance, defined as a p < 0.05, was assessed using the log-rank test. To determine the effect of particular prognostic factors on survival, a multivariate analysis was performed using Cox’s regression model. The study included 239 men and 17 women with an average age of 50.9 years (range, 26–87 years). Of the 256 patients, 39 were classified as T1, 55 as T2, 64 as T3, and 98 as T4. The N classification was N0 in 153 patients (59.8%), N1 in 38 (14.8%), N2b in 48 (18.7%), N2c in 13 (5.1%), and N3 in 4 (1.6%) patients. The cancer stage was classified as I in 32 patients (12.5%), II in 34 (13.3%), III in 63 (24.6%), and as stage IV in 127 (49.6%) patients (Table 1). The mean follow-up period was 67 months (range, 2–171 months). EPOR, erythropoietin receptor; *statistically significant (p < 0.05). 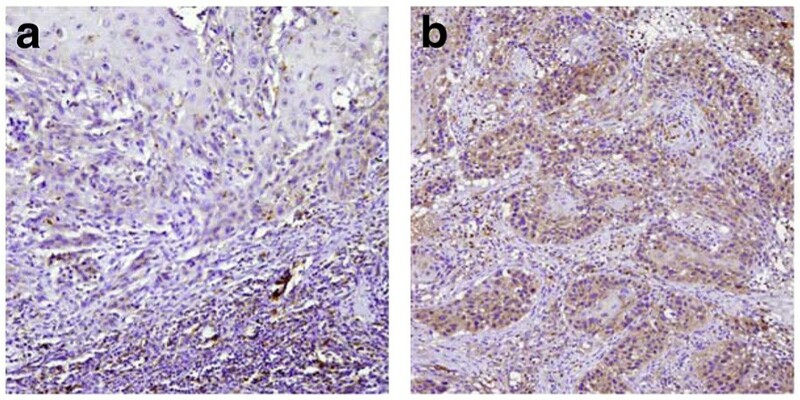 EPOR immunoreactivity was observed in the neoplastic epithelial cells of the OSCC (Figure 1A and B). Late-stage OSCC was characterized by diffuse and strong EPOR immunoreactivity in the neoplastic epithelial cells (Figure 1B). The immunostaining indicated low EPOR expression in 146 patients and high expression in 110. Table 1 shows EPOR expression in the cancer cells and the correlation with clinicopathological variables. High expression of EPOR was significantly correlated with the advanced T classifications (p < 0.001), positive N classification (p = 0.001), and an advanced TNM stage (p < 0.001). Immunostaining for EPOR expression in oral squamous cell carcinoma. (A) The representative tumor shows only weak EPOR immunoreactivity in the neoplastic epithelial cells at the border of the tumor. (B) The representative tumor exhibits diffuse and strong EPOR immunoreactivity in the neoplastic epithelial cells. Note that some inflammatory cells are also positive for EPOR. Original magnification, 100 × . EPOR expression was measured in 12 paired samples of tumor tissue and adjacent non-tumor oral tissue (from early to late stage) using Q-RT-PCR. EPOR mRNA was overexpressed in all OSCC tissue samples, indicating a higher level of EPOR in the tumor tissue than in the adjacent non-tumor oral tissue after normalization using GAPDH (Figure 2A). To confirm this finding, EPOR protein expression was examined in 8 additional pairs of tumor and adjacent non-tumor tissue using the Western blotting technique. The results showed that EPOR expression was higher in the tumor tissue than in the adjacent non-tumor tissue in all four samples (Figure 2B), indicating that EPOR expression is low in adjacent non-tumor oral tissues and elevated in oral cancer tissues. Q-RT-PCR and Western blot analyses of EPOR expression in oral squamous cell carcinoma (OSCC). (A) The mRNA expression level of EPOR was determined by Q-RT-PCR in 12-paired OSCC patients (from early tumor stage to late tumor stage). Results were normalized against the expression level of GAPDH mRNA in each sample. (B) The Western blot analysis showed high EPOR expression in the tumor tissue compared with that in the adjacent non-tumor tissue in 8-paired tissue samples (from early tumor stage to late tumor stage). β-Actin was used as an internal control. EPOR, erythropoietin receptor; N, adjacent non-tumor tissue; T, tumor tissue. 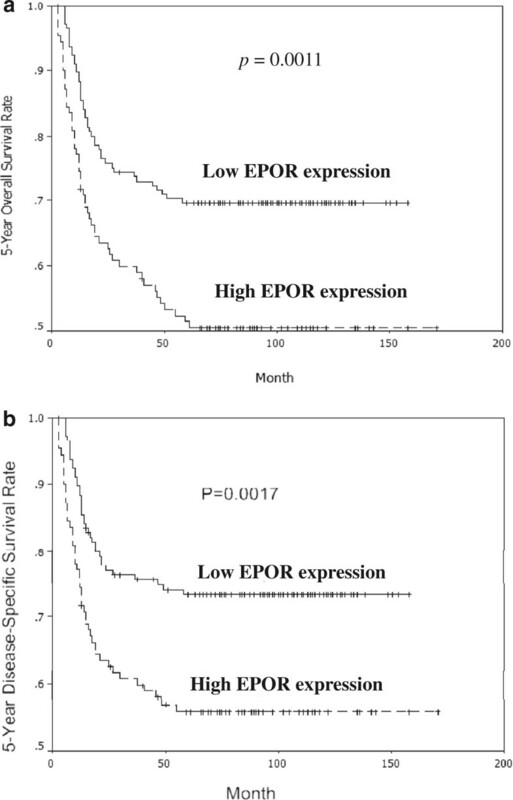 Patients with low levels of EPOR expression had a significantly higher 5-year overall survival rate than patients with high levels of EPOR (p = 0.0011; Figure 3A). Similarly, the 5-year disease-specific survival rate in patients with low EPOR expression was significantly higher than that in patients with high EPOR expression (p = 0.0017; Figure 3B). Furthermore, patients with advanced T classification, positive N classification, or advanced TNM stage had significantly lower 5-year overall and disease-specific survival rates compared to patients with early T classification, negative N classification, or early TNM stage (all p < 0.001; Tables 2 and 3). However, the multivariate analysis using Cox’s regression model revealed that only the T and N classifications were independent prognostic factors for the 5-year overall survival rate (p = 0.015) and 5-year disease-specific survival rate (p = 0.0025; Tables 4 and 5). The 5-year (a) overall and (b) disease-specific survival rates were assessed using the Kaplan-Meier analysis. The patients with a low level of EPOR immunostaining in the tumor had a significantly better survival rate compared to those with a high level of EPOR immunostaining. EPOR: erythropoietin receptor; *statistically significant (p < 0.05). EPOR is highly expressed in the tumor cells of head and neck cancer, particularly in the hypoxic and infiltrating areas. EPOR rather than EPO may be upregulated by hypoxia in the tumor bed, and the high expression of EPOR in the tumor tissue may promote neck lymph node metastasis . High EPOR expression in tumor tissue was found to be significantly correlated with high microvascular density in tongue cancer in an immunohistochemical study . This finding suggests that the hypoxic microenvironment in a tumor may stimulate angiogenesis and promote tumor survival and growth. EPOR in normal hematopoietic tissues is responsible for normal erythropoiesis. Abnormal EPOR function is associated with proliferative disorders of bone marrow such as primary erythrocytosis . EPOR overexpression in tumor tissue is associated with a poor prognosis in a variety of malignancies, including breast cancer [20–23], melanoma , renal cell carcinoma , gastric cancer , pediatric tumors , and uterine and ovarian carcinoma . However, only a few studies with limited cases have investigated the prognostic role of EPORs in OSCC. Recent studies have reported that EPO and EPORs are adverse prognostic factors for overall survival in patients with SCC of the tongue. Roh et al. evaluated the prognostic value of hypoxia markers in 43 cases of T2-staged oral tongue cancer. They investigated the association between the 5-year survival rate and hypoxia biomarkers, such as HIF-1α, IF-2α, CA-9, GLUT-1, and EPOR, and found that EPOR was an independent biomarker in these patients, with a high propensity for regional metastasis Li et al. reported that EPORs influenced the prognosis of carcinogenesis, angiogenesis, and the malignant progression in SCC of the tongue. Moreover, they found that EPORs were an independent prognostic marker. The results of our study are consistent with those of Li et al. and suggest that EPOR is a significant prognostic indicator in patient with oral cancer. Thus, EPOR may play a role in tumor proliferation, apoptosis, and angiogenesis . The TNM staging system is used to evaluate and predict the prognosis of patients with head and neck SCC (HNSCC). Clinicians develop therapeutic strategies according to the TNM stage of patients. Biomarkers that could reliably predict tumor behavior would be useful in the clinical setting. The clinical value of biomarkers related to angiogenesis and hypoxia in patients with HNSCC had been established in recent years [31–36]. These biomarkers were significantly correlated with tumor invasiveness and prognosis. The present study investigated EPOR expression in a large sample of patients with OSCC using immunohistochemical analysis. We found that a high EPOR expression was significantly correlated with advanced T classification, positive N classification, and advanced TNM stage. It represents the rapid proliferation of tumor cells may outpace the blood and nutrition supply. This probably leads to tumor necrosis and hypoxia in the microenvironment of tumor and may result into the higher level of EPOR. Furthermore, EPOR levels had a significant impact in the 5-year overall and 5-year disease-specific survival rates. 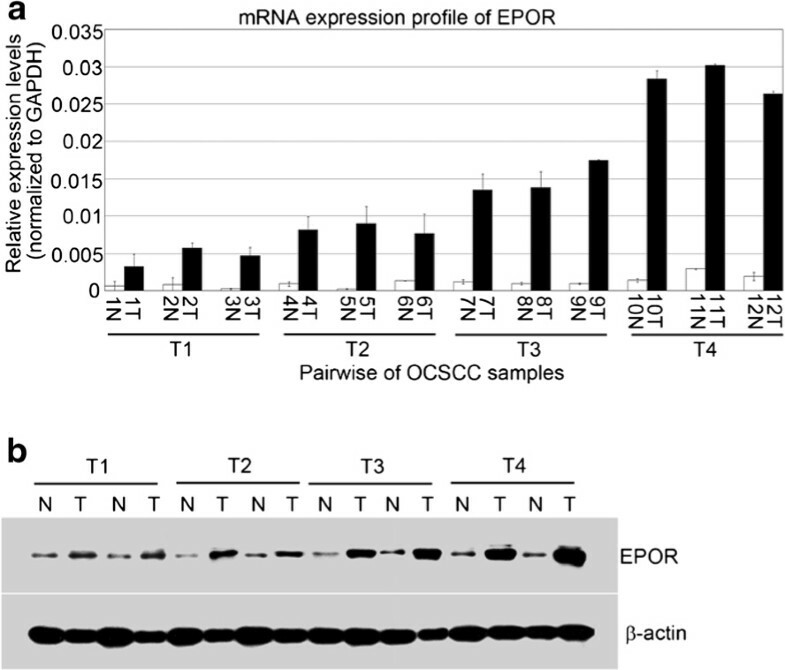 We found that EPOR was overexpressed at both the mRNA and protein levels (data of Western blot assay) in OSCC tumors. Our findings are consistent with several reports showing that patients with oral cancer who had a high levels of EPOR expression had a poor 5-year overall survival rate [18, 29]. To avoid the impact of other adjuvant treatment in the result of survival, the patients with high expression of EPOR still showed the poorer 5-year disease-specific survival significantly among patients underwent surgery only (p = 0.0079). High EPOR expression in patients with OSCC was associated with tumor progression in the present comprehensive study. These results suggest that EPOR expression is an important prognostic factor for OSCC. Thus, EPOR expression may serve as a treatment target for OSCC in the future. This study was funded by grants obtained by Dr. Chih-Yen Chien and by Dr. Chang-Han Chen from Kaohsiung Chang Gung Memorial Hospital Taiwan (grant numbers: CMRPG890091, CMRPG890921, and CMRPG8A0391 respectively). We also thank the Center for Translational Research in Biomedical Sciences, Kaohsiung Chang Gung Memorial Hospital, to provide instruments for this study (CLRPG871342), Chang Gung Medical Foundation Kaohsiung Chang Gung Memorial Hospital Tissue Bank for technical support, and providing the study materials (CLRPG870463, CMRPG870461). YTL, HCC, CHC, GLA, and CYC: collected the clinical data of patients, conceived the study design, carried out and coordinated immunohistochemical examinations of tumor specimens, and drafted the manuscript. HKC and CCH: participated in the interpretation of data and conducted immunohistochemistry analysis. CHC: performed the IHC staining and biochemical experiments. FMF: performed statistical data analysis. All authors read and approved the final manuscript.